Putin can’t afford to leave the office because he will be in real danger of being prosecuted for things he and his people did during their stay in power. I wouldn’t overestimate the importance of my popularity in the country and abroad but at the end of the day it’s not as important because I believe that my presence here could make some difference and it could encourage people. I may play some exhibition games so I don’t want to quit the game of chess completely. I just decided and it’s a firm decision not to play competitive chess anymore. I’m still number one and I just recently won a major tournament ahead of my toughest rivals so I think I had a few years ahead of me if I decided to stay. It was not about losing my mental power; it’s about not feeling good about my contribution to the game. I’ve met enough KGB colonels in my life. It’s quite difficult for me to imagine my life without chess. Ukraine had quite serious impact on the many Russians. They could see that ordinary people in Ukraine which is a bordering state, very close to Russia, the people of this state are, they didn’t want to tolerate anymore the power abuse by Ukrainian officials. There are many facts showing that Putin’s people enriched themselves by using power mechanisms so that’s why for them losing power means losing their fortunes. I think that it’s a vital moment now for Russian democracy to convince people that it’s only our actions, our joined actions and protests that could force Kremlin to reconsider its plans to abolish presidential elections. 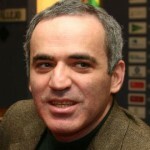 Garry Kimovich Kasparov was born in Baku, Azerbaijan. He is a Russian chess Grandmaster, former World Chess Champion and writer, considered by many to be the greatest chess player of all time. From 1986 until his retirement in 2005, he was ranked world No. 1 for 225 out of 228 months. His peak rating of 2851, achieved in 1999, was the highest recorded until being surpassed by Magnus Carlsen in 2013. He also holds records for consecutive professional tournament victories and Chess Oscars. He has written several books include: Winter Is Coming, Checkmate! : My First Chess Book, Checkmate Tactics, Learn chess with Gary Kasparov, Lessons in Chess, and Garry Kasparov's Chess Challenge.